Do you hold a public transport travelcard? You do not need a public transport travelcard or a SwissPass to open a customer account. If you already hold a public transport travelcard, you can register more quickly. I hold a public transport travelcard. I do not have a public transport travelcard. Customer number Please enter your ten-digit customer number incl. hyphens in the format 000-000-000-0. You will find this on the front of your SwissPass, on the temporary SwissPass document or on your public transport travelcard. Please enter your ten-digit customer number incl. hyphens in the format 000-000-000-0. You will find this on the front of your SwissPass, on the temporary SwissPass document or on your public transport travelcard. Postcode We need the postcode of your place of residence as a security element. We need the postcode of your place of residence as a security element. Please select your login details for the SwissPass login. E-mail (counts as username) To complete the registration process you have to have access to the e-mail account indicated at a later time. To complete the registration process you have to have access to the e-mail account indicated at a later time. Password Your password must be between 8–50 characters long and include at least one letter and at least one digit. Please observe upper and lower case. Your password must be between 8–50 characters long and include at least one letter and at least one digit. Please observe upper and lower case. The Direct Traffic Office of the Swiss Public Transport Association (VöV) issued SBB AG with a mandate to manage the swisspass.ch platform. When you call up information and documents on swisspass.ch, you declare that you are in agreement with the following provisions. Certain offers and services are subject to additional terms and conditions. In the event of a contradiction, the special terms and conditions shall apply. SBB AG reserves the right to change services, offers and conditions relating to the use of offers on swisspass.ch. SBB AG can also refuse or block access to the services and offers on swisspass.ch without giving any reasons. SBB AG can, at any time, change, add or delete the content of swisspass.ch and these provisions in whole or in part. This applies also to changes of information, services and offers. Of course, we will notify you of these changes. If you continue to use swisspass.ch after changes to these conditions have been published, you are deemed to have accepted the changes. SBB AG ensures that it complies with the statutory data protection regulations. You can find more detailed information here. The information, services, offers, fares, price lists and other such items published on swisspass.ch do not represent an invitation to purchase products and services. Neither do they constitute an invitation to conduct transactions, whether legally binding or otherwise. We will draw particular attention to any exceptions. The public transport tariff provisions remain reserved and take precedence among the offers published on swisspass.ch. Despite all precautions, technical inaccuracies, exceptions or typographical errors on swisspass.ch cannot be excluded. SBB AG cannot guarantee that the information, fares, price lists and other such items published on the website are accurate, complete or up-to-date, and accepts no liability in this respect. All content (text, diagrams, images, etc.) on swisspass.ch is protected by copyright and is the property of SBB AG. This also applies to the brands and logos (whether expressed in words, pictures and/or sounds) featuring on swisspass.ch. This website may also contain information on third-party rights and copyright, which must additionally be upheld. 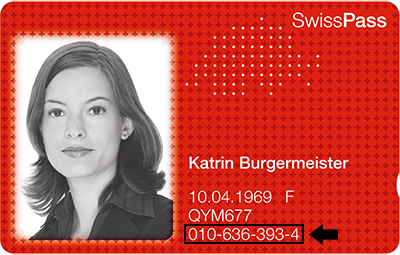 The information and services contained on swisspass.ch are supplied by SBB AG solely for private use and for information purposes. It is permissible to download, save, print or duplicate by other methods individual pages and/or sections of swisspass.ch, provided that none of the copyright notices (e.g. ©SBB AG) or other legally protected designations are removed. All property and utilisation rights remain with SBB AG which can revoke the aforementioned permission at any time. None of the information or services contained on swisspass.ch may be reproduced (in full or in part), transmitted (electronically or by other means), modified, linked or used for public or commercial purposes without the prior written consent of SBB AG. Exclusion of liability and warranty claims. SBB AG declines on behalf of itself and all direct traffic businesses all liability for any losses or damage that you or a third party may suffer in connection with your access to or use of swisspass.ch, parts thereof or links to third-party websites. Anyone visiting swisspass.ch, using the information contained therein or availing themselves of the offers featured therein does so on their own responsibility. We also decline all liability for lost earnings, for Internet-related malfunctions (e.g. suspension of operations, disruption of functions, viruses, harmful components, terrorist acts, etc. ), for misuse by third parties (hacking into data, copying, etc.) and for loss of programs or other data in your information systems. This applies even if swisspass.ch indicates the possibility of such damage. Some links on swisspass.ch lead to third parties' websites. These websites are outside the control of SBB AG and swisspass.ch. We accept no responsibility for the correctness, completeness or lawfulness of the content of these websites or of any links to further websites, nor for any offers, products or services contained therein. This applies even if such websites feature the SwissPass logo or another protected name. Users make use of the links to third-party websites provided on their own responsibility. You can visit our websites without having to provide any personal information. In order to recognise trends and improve our online offering we analyse usage data, such as the page visited, click behaviour, access frequency, browser used, date, time, etc., on an anonymous basis. No assumptions are made regarding your person. To help us tailor our services to meet your needs, on some pages we ask you to provide personal information (e.g. name, address telephone number, e-mail address and the services you are interested in, etc). By providing your personal details, you give us your consent to use them for personalised marketing. When you provide us with an e-mail address, you acknowledge that unencrypted electronic e-mail is not secure, and permit us to use this channel to communicate with you. We do not pass on information. External service providers whom we instruct to process your request or your order will receive the data they require for this. All parties who receive and process data agree to observe the laws of data protection and data security. External providers offering services within the framework of SwissPass receive the data relating to your order. Marketing and personal data analysis. The passenger or contracting party acknowledges that he or she may be sent advertising (personalised information and offers) by SBB, the associations and/or the direct traffic PTEs unless an explicit objection is raised. If you wish to revoke the permission of SBB, the associations and/or the “direct travel” public transport enterprises to process your personal data for marketing purposes, you can do so informally at any staffed sales office or by calling the SBB Contact Center (opt-out). After you have opted out you will not be contacted by means of marketing activities any longer. However, your data will remain in our databases if you make use of one or more valid services (Half-Fare or GA travelcard, partner services, etc.). Storage and backup of your data. SBB AG takes reasonable precautions and uses relevant security technology to protect your data. Your data will be stored only for as long as is absolutely necessary. The courts at the registered office of SBB AG in Berne have sole jurisdiction over any disputes arising between you as visitor to and user of swisspass.ch, and SBB AG. Swiss law shall apply exclusively.